For me, it’s all about tolerance. . .
. . . and setting limits. 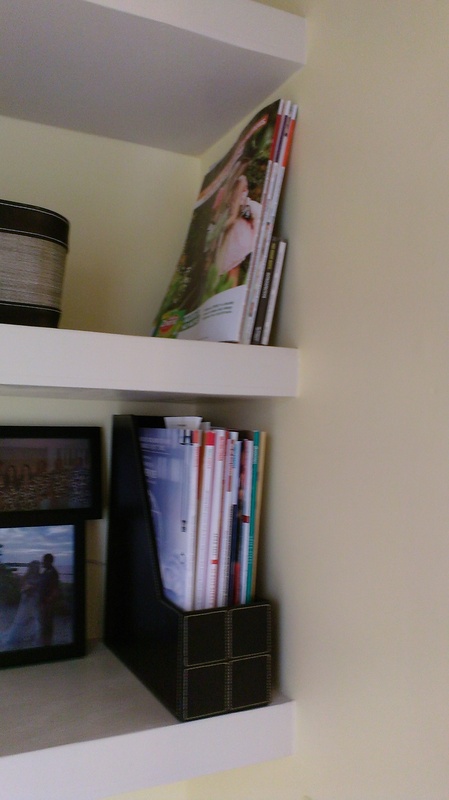 This is where I keep my magazines. It’s the only place. You see, I seldom look at a magazine once I’ve read through it. But every once in a while I feel the need to hang on to one or two (or a dozen). But I know that I don’t ever look at them again, so why? I know that it’s all about attachment. A lot of these are cooking magazine. I like the possibilities that they offer. A lovely home cooked meal. Great! But it doesn’t always happen. So the limit I set for myself is the leather magazine holder you see at the bottom of the photo. I have more than will fit, so it’s time to purge. I am waiting for a nice weather day, when I can sit outside and review all these magazine, make some decisions, purge and then move forward. I admit, my tolerance is very low for clutter. What is your clutter tolerance? This entry was posted in Inspiration, Residential Organizing and tagged Clutter, Magazine, Managing Magazine Subscriptions, Tolerance. Bookmark the permalink.